Professor Gebo is a biological anthropologist/primatologist with interests in primate anatomy and evolution. His research focuses on understanding locomotor adaptation and evolution in living and fossil primates. Professor Gebo has conducted fieldwork in the western United States, Central and South America, Africa and Asia. 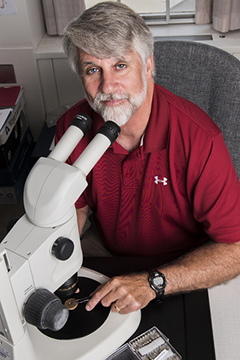 His most recent field projects have been collecting fossil primates from the Eocene of China. He was named an NIU Presidential Research Professor in 1998, a Presidential Teaching Professor in 2008 and a Board of Trustees Professor in 2008 and 2013. In 2014, Professor Gebo was honored with a U.S. Professor of the Year award by the Carnegie Foundation for the Advancement of Teaching and by the Council for Advancement and Support of Education. Professor Gebo teaches courses in primate and human anatomy and evolution and introductory physical anthropology. Additional postcranial elements of Teilhardina Belgica, the oldest European primate. American Journal of Physical Anthropology 156:388-406, with R. Smith, M. Dagosto, and T. Smith, 2015. The Oldest Primate Skeleton and Early Haplorhine Evolution. Nature 498:60-64, with Ni, X., Dagosto, M., Meng, J., Tafforeau, P., Flynn, J., and Beard. K.C., 2013. Species Diversity and Postcranial Anatomy of Shanghuang Primates. Evolutionary Anthropology 21:224-238, with M. Dagosto, X. Ni, and C. Beard, 2012. A Haplorhine First Metatarsal from the Middle Eocene of China. In J.G. Fleagle and C.C. Gilbert (Eds. ): Elwyn Simons: A Search For Origins. Springer, New York, pp. 229-242, with M. Dagosto, K.C. Beard, X. Ni, and T. Qi, 2008. Foot Bones from Omo - Implications for Hominid Evolution. American Journal of Physical Anthropology 129:499-511, with G.T. Schwartz, 2006. Middle Eocene Tarsals from China: Implications for Haplorhine Evolution. American Journal of Physical Anthropology 116:83-107, M. Dagosto, K.C. Beard, and Qi Tao, 2001. The Oldest Anthropoid Postcranial Fossils and their Bearing on the Early Evolution of Higher Primates. Nature 404:276-278, with M. Dagosto, K.C. Beard and Qi Tao, 2000. Climbing, Brachiation and Terrestrial Quadrupedalism: Historical Precursors of Hominid Bipedalism. American Journal of Physical Anthropology 101:55-92, 1996. Positional Behavior in Five Sympatric Old World Monkeys. American Journal of Physical Anthropology. 97:49-76, with C.A. Chapman, 1995.